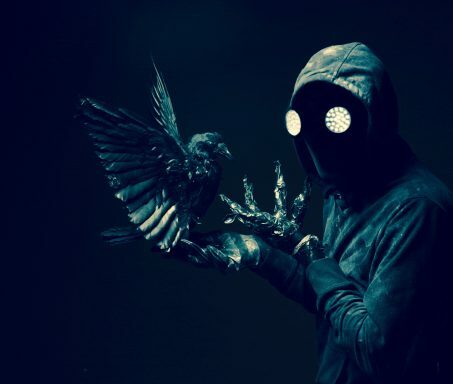 We sent Run-Riot contributor Edward Gosling- who also happens to be a circus performer himself- along to Aeronaut; here’s what he made of it. 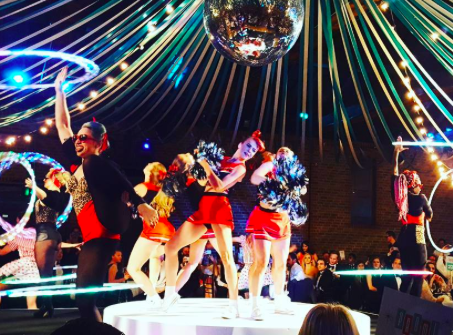 It’s a strong sign that London’s vibrant and growing cabaret and circus scene is on an upswing when a venue like the Aeronaut opens it’s doors. Drink, the group behind the bar, have 39 venues in Brighton and 5 in London; this is the first with an entertainment space like this. Jackie Le, aerialist and regular on the circuit for 7 years now, has put together the programme, designed the space, lighting and truss and even gotten her hands dirty painting the stage. It’s a big job, as there will be a show Thursdays, Fridays and Saturdays each week. But on the strength of this evening, which easily reaches capacity, it has very quickly found it’s feet. 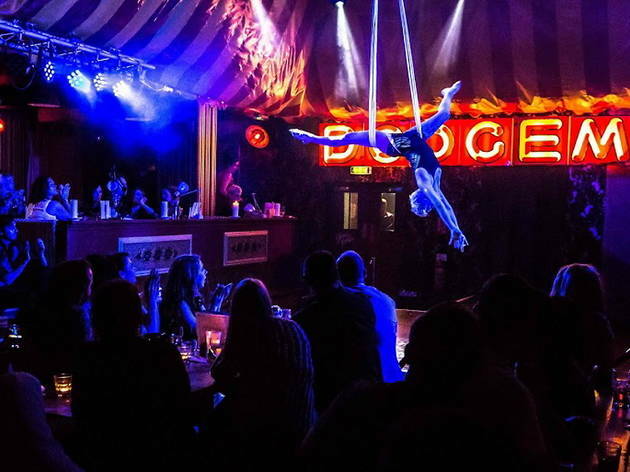 Tonight sees an A-list cast of regulars with compere Benjamin Louche and acts from Mat Ricardo, Felipe Reyes, Anna the Hulagan, Rosie Cheeks and dancers Cabaret Rouge plus a DJ set later on from The Roustabouts. Felipe is the only one on the bill I haven’t seen before, but his cheeky and suave handbalencing act is a big highlight. Performing to the White Stripes ‘Seven Nation Army’ he elicits laughs by getting the audience to clap in time, encouraging them by tapping out a beat with his upside-down feet. His presence on stage turns what is often an isolated individual display of skill into a moment the audience can share in and be a part of. The night never dips; none of the cast are trying out new material here, but as a consequence it’s well honed and executed with a confidence that comes from knowing the material. Those of you who know Louche may have heard his 3 jokes of increasing filthiness before, but he is a great force on stage and works the crowd in just the right way building up anticipation for what’s coming next. Similarly Mat Ricardo’s signature move, the reverse table cloth, has been around for a little while, performed on street shows and cabaret stages alike, but it works so well in framing an act that is full of impressive feats, comic asides and unexpected left turns. Anna’s fire hula hoop act is all swagger and charisma; performed in high heels, she struts and spins. Rosie Cheeks finishes off the circus with an aerial hoop act that is both good fun and full of complex and dynamic movements. She has a great performance face and seems to be enjoying it as much as the audience. The three dancers open and close the night with a seductive set of routines that are coquettish and risqué. That they manage to pull off a Can-Can routine is a great achievement as the music is so brash and big that unless you can go flat out for the duration it can easily fall flat, very few manage to be anything other than immensely irritating. I have only good things to say of the Aeronaut. Outside of the entertainment, it’s a nice bar with a huge beer garden all in theme, which promises to be lovely in the summer months. In the opening weekend the standard has been set very high, so it remains to be seen whether it can stay at this level in the upcoming months, though I strongly suspect it will. A great success then and congratulations to Drink for taking a chance in going in a new direction and to Jackie Le for her work putting it together. The Aeronaut is a big addition to Acton and West London’s night-life.